Loi Krathong or Loy Krathong is a mesmerizing festival celebrated on the full moon of the 12th month of Thai Lunar Calendar. Thousands upon thousands of Krathongs or little floats made of Banana leaves, coconut shells etc. with flowers, with a candle or lamp in the middle. As the thousands of these lamps start floating in the rivers, it seems that autumn sky has come to earth and has made rivers of Thailand its home for a night. 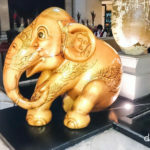 As I have observed earlier we Indians and Thais have a lot in common, for our Holi the Thais celebrate Songkran, and if I am allowed to compare, the Loi Krathong Festival is the same festival that we celebrate on Kartik Poornima, falling mostly in November and the way of celebration is very similar. 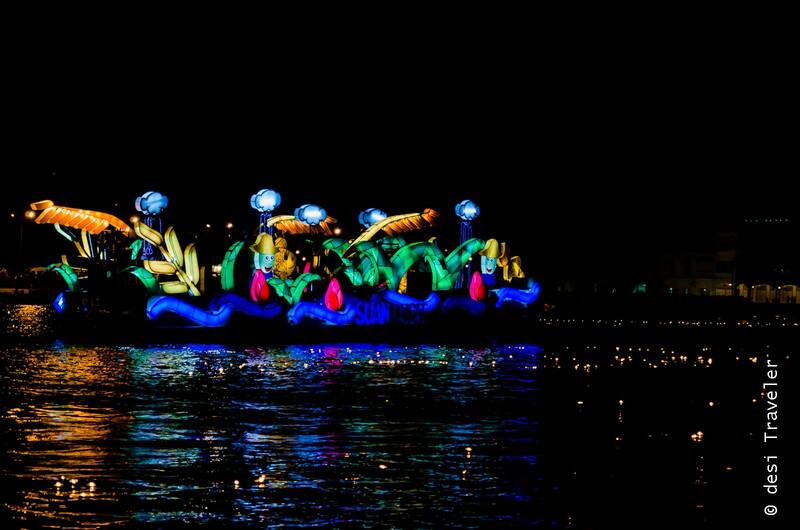 Both the festivals honor the rivers and lamps are floated in the river. 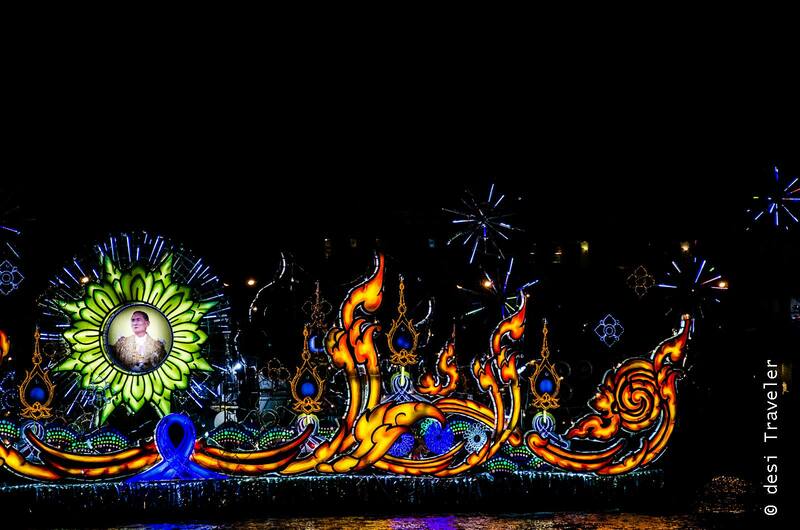 The biggest celebration of Kartik Poornima in a public space in India is on the Ghats of Varanasi and in Thailand, the main festival happens in Bangkok on the royal river – Chao Phraya. 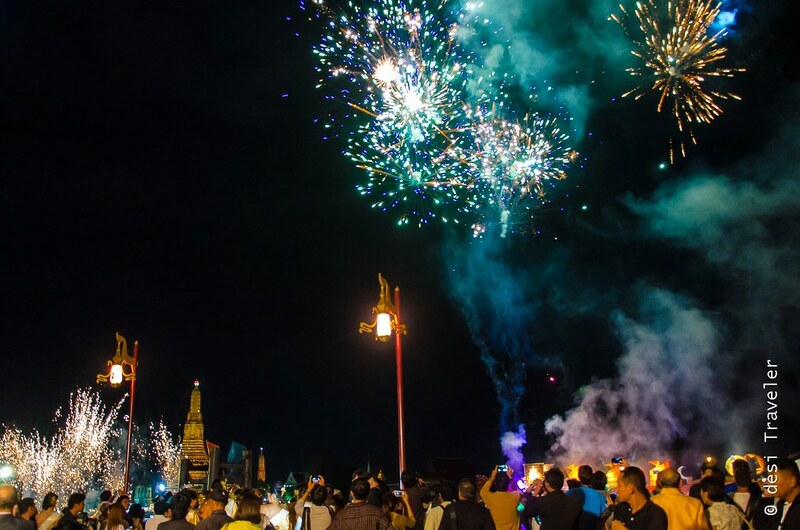 Thailand also has Loi Krathong festivities in Ayutthaya, Chiang Mai and Sukho Thai and other cities and even at a local level in smaller towns and villages. 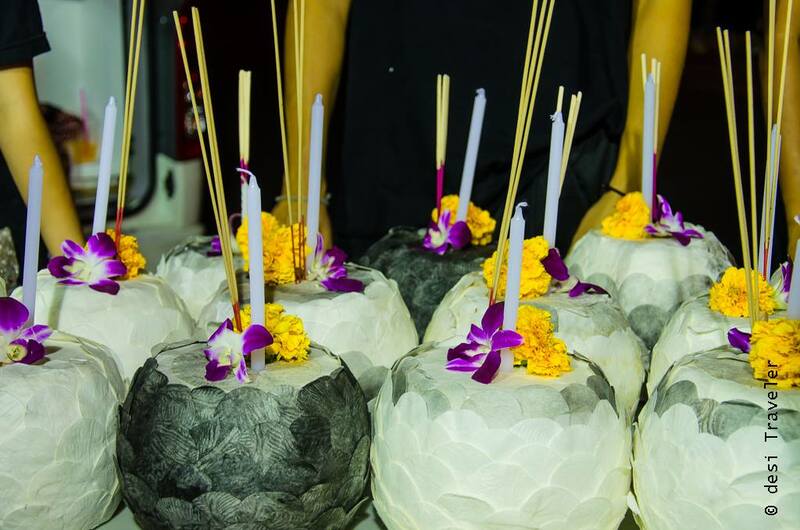 Well the two festivals are celebrated on the same day on the lunar calendar and the ritual is more or less similar, but in Thailand, Loi Krathong is celebrated on a grander scale and is patronized by the Royal family also. Some people confuse Loi Krathong as the festival when hundreds of sky lanterns are floated in the air, but that is a different festival with roots in Northern Thailand. Partially they are correct as Loi Krathong and Yi Peng, or the festival of Sky lanterns (Khom Loi), is celebrated on the same day that is full moon day of the 12th lunar month of Thai Calendar. BTW: Have you participated in 2016 Calendar Giveaway Contest for fans and readers of desi Traveler Blog? 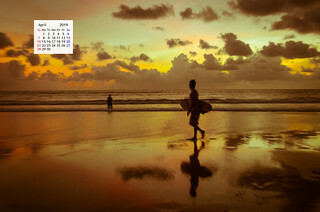 If not please go ahead as this year 10 desi travel calendars will be sent to the winners. 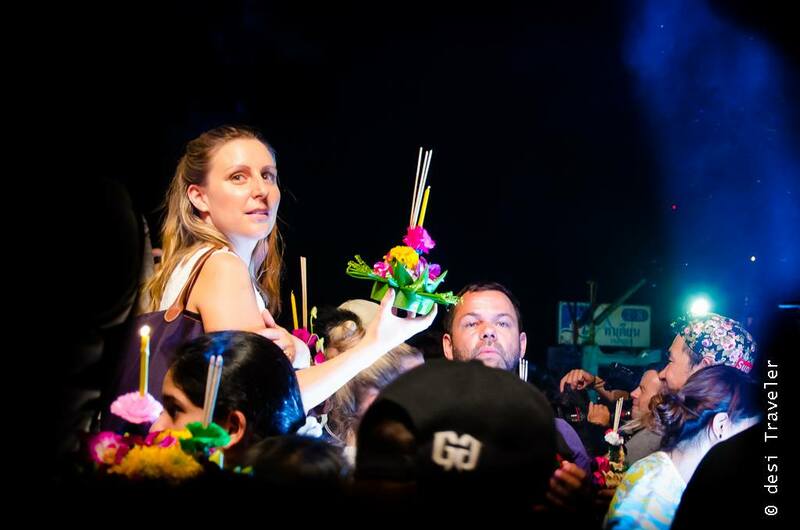 So in this post, I will share with you my experience of joining the official Loi Krathong festivities in Nagaraphirom Park, Bangkok, on the bank of Chao Phraya or the river of Kings. 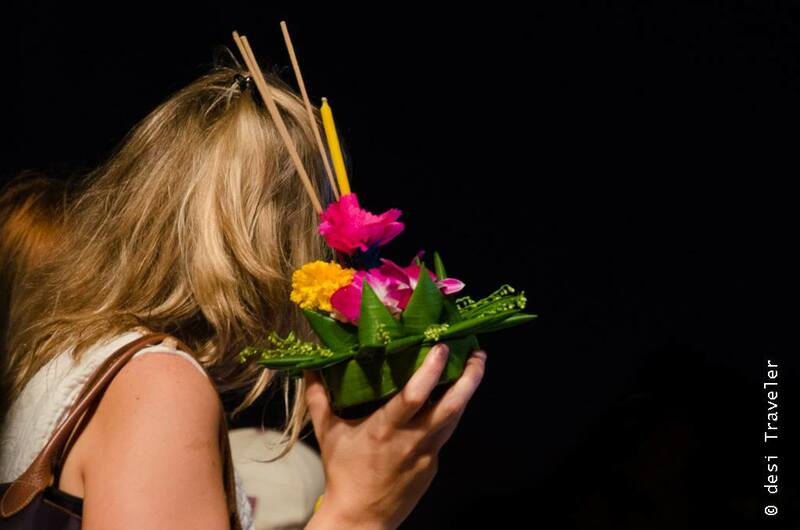 But like I said Loi Krathong is a festival that is celebrated all over Thailand and people float Krathongs or small rafts made of bamboo baskets, coconut shells, palm leaves, Banana leaves etc. that have offerings of flowers, and lamps for the rivers. The main function happens in a grand ceremony at Nagaraphirom Park, Bangkok, and when I attended dignitaries like H.E. Kobkarn Wattanavrangkul, Thailand’s Minister of Tourism and Sports graced the occasion. Many foreign dignitaries, local as well as media from around the world were present. As I was there as a guest of TAT New Delhi, we had good seats to watch the ceremony and later I had a good chance to click pictures of the decorated barges as they floated with their colorful decorations showcasing Thai history, mythological stories and cultural richness and vibrancy of Thailand. 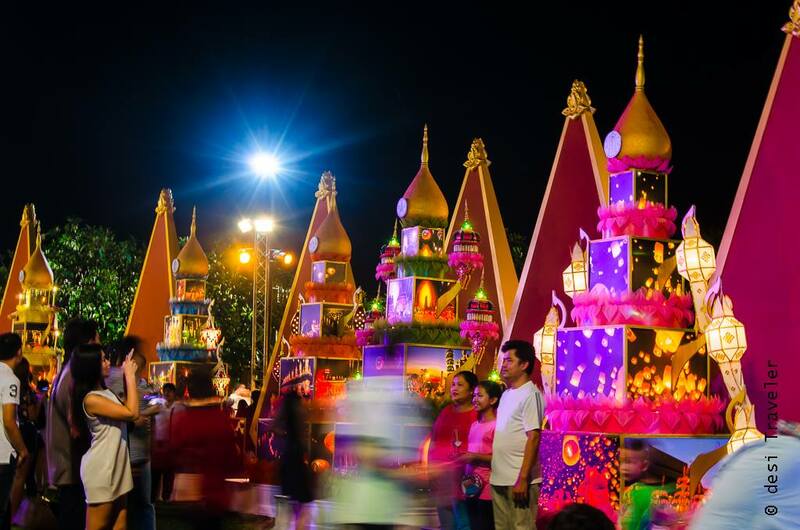 At the entrance of the Nagaraphirom Park, there were many colorful pagoda and temple shaped decorations illuminated with lights. I am not sure if they were replicas of some temples or just for decorations, but they were popular among the local crowds and many of them were posing with the decorated temples to get their pictures clicked. 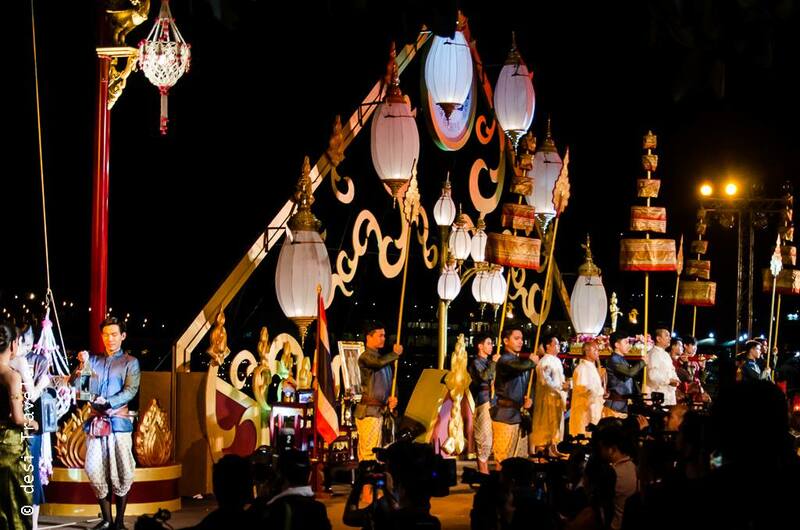 The main function after inauguration speech was followed by a display of Thai dance drama that was based on Ramayana and later there were some beautiful songs sung by a local band. 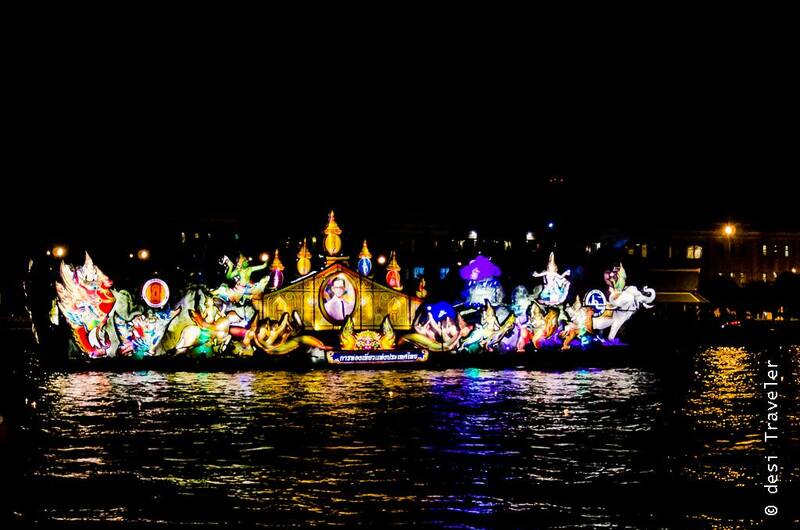 But the main attraction of the Loi Krathong festival happens literally behind the stage, which in this case is the Chao Phraya River. 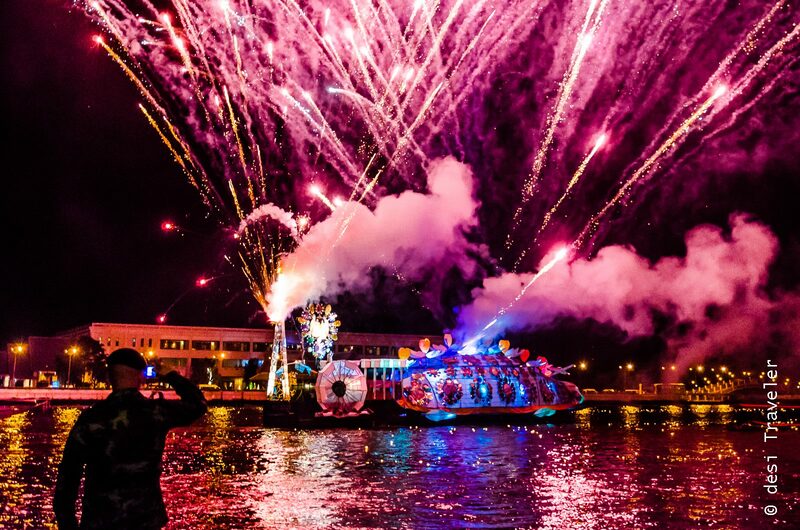 As the official celebrations on the stage came to an end the action moved towards the river and one by one highly decorated barge started appearing in the river. It is like 26th January Parade in Delhi. 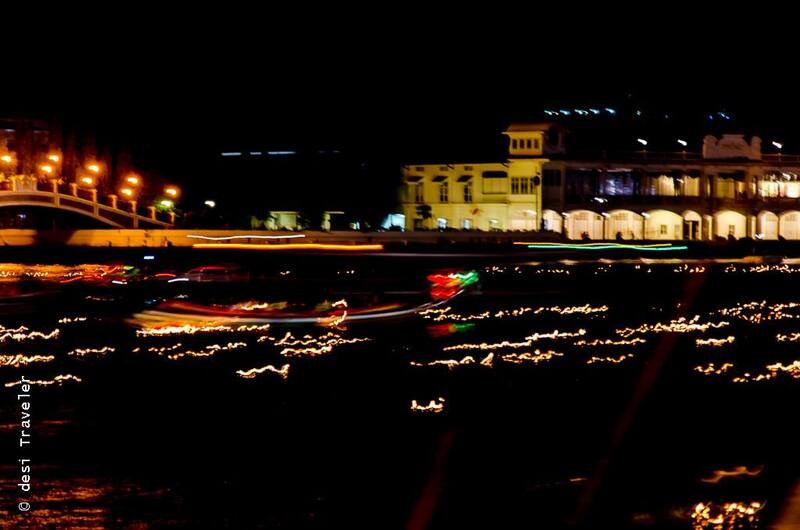 near India Gate only there is no Rajpath but Chao Phraya, the River of Kings is the Royal pathway where the Loi Krathong is celebrated. 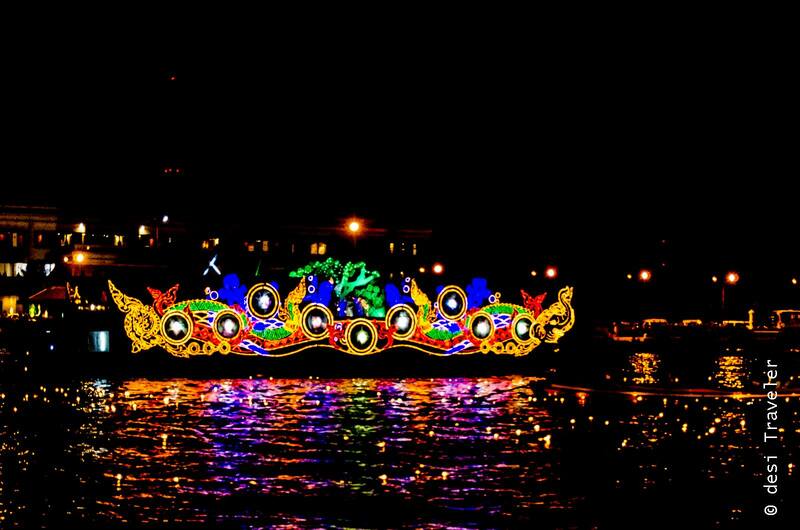 The barges with their colorful scenes are in no hurry to reach anywhere, for it is not a race they are participating, but the aim is to enchant the cheering crowd on the banks of Chao Phraya. 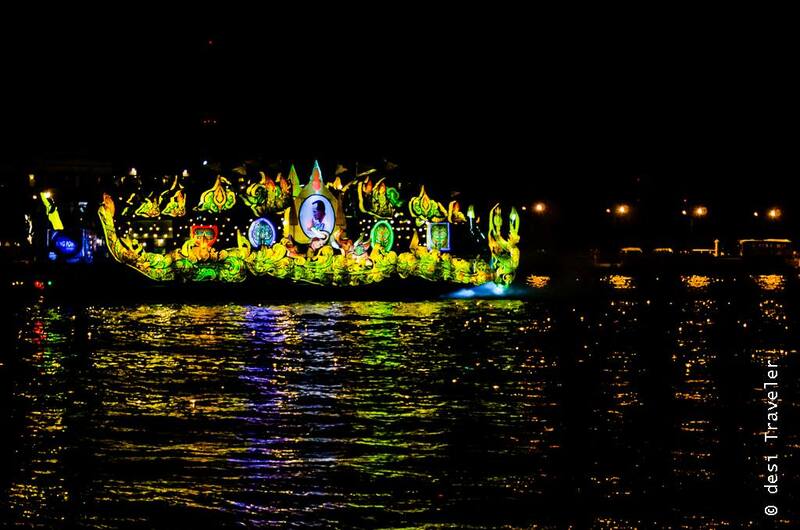 While it is not a race, but still the Barges are participating in a competition for the best decoration and theme etc. Winning prize for the best barge is a very prestigious moment for the Barges and they leave no effort to make sure their decorations are the best. 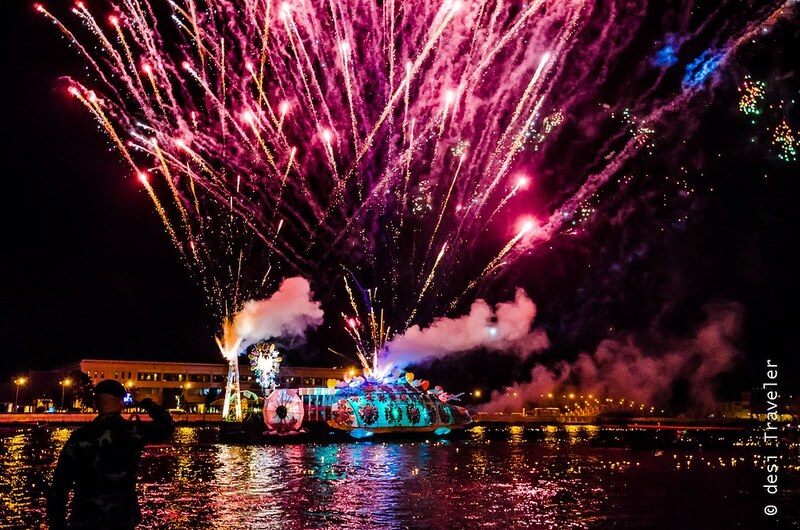 The leisurely pace of the barges let you gawk at them in amazement, and you are awakened from your dreamy sequence by sudden bursting of fireworks. You scramble for your camera, fiddle with the settings and try to take a picture or two. But hundreds of people around you have exactly same plan and it is then you realize you need a better vantage point to click pictures. Slowly I wriggle to the edge of the water, while a security officer tells me to keep up a respectable distance from the bank and not fall into the flowing Chao Phraya. I thank him for his suggestion and keep up a good distance between myself and the river of Kings. As these barges will reach directly opposite to the function area they slow down a bit and we could hear the announcement about the scene created on the barge. The sets created on the barges varied from themes from epics like Ramayana to life of Buddha and even celebrating the life of rice farmers in rural Thailand. But as I said I was in the official function on the Nagaraphirom Park, but Loi Krathong is celebrated throughout Bangkok and Thailand, and suddenly the first batch of floating Krathongs with their flickering lamps, bravely duel the waves and the breeze take over the river. 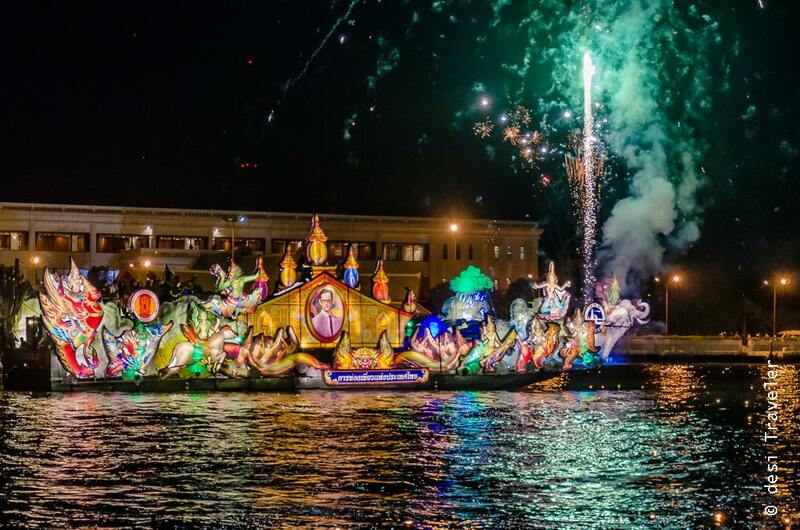 The river is on fire, as thousands of lamps sail on the river making it the mirror image of the Milky Way. Maybe I am correct, for you cannot see any stars above due to full moon, so maybe this is the stars way of enjoying a day off and they do so by descending on the Chao Phraya and swim in the river? Every now and then a tourist boat passes by with songs and aromas of Thai food escaping from its decks, teasing those on the banks about the special Loi Krathong Dinner with boat cruise on Chao Phraya. 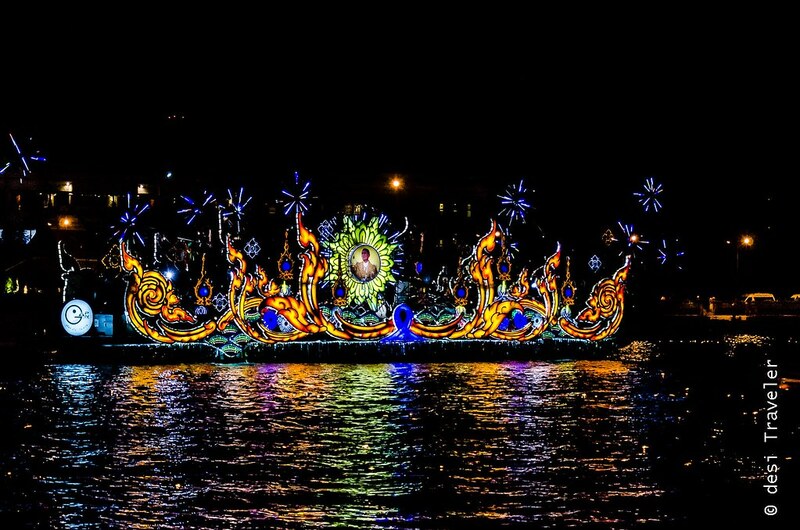 A sweet voice on the PA system announces that the visitors can now float their Krathongs on the Chao Phraya, bringing a big cheer from the crowd as everybody wants to float their own stars and add to the grandeur of the Milky Way in the river of Kings. 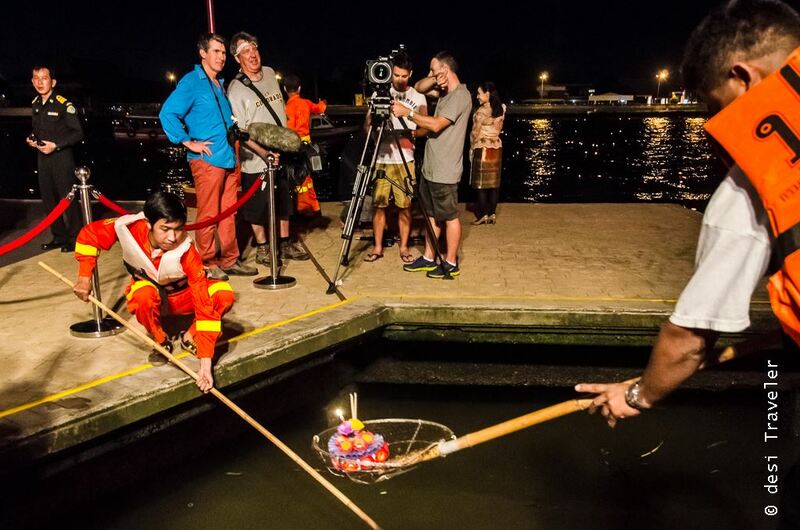 As there are too many people, officers, and workers appointed by the event organizers and Thai Police help them to lower their Krathongs in the flowing waters of Chao Phraya? 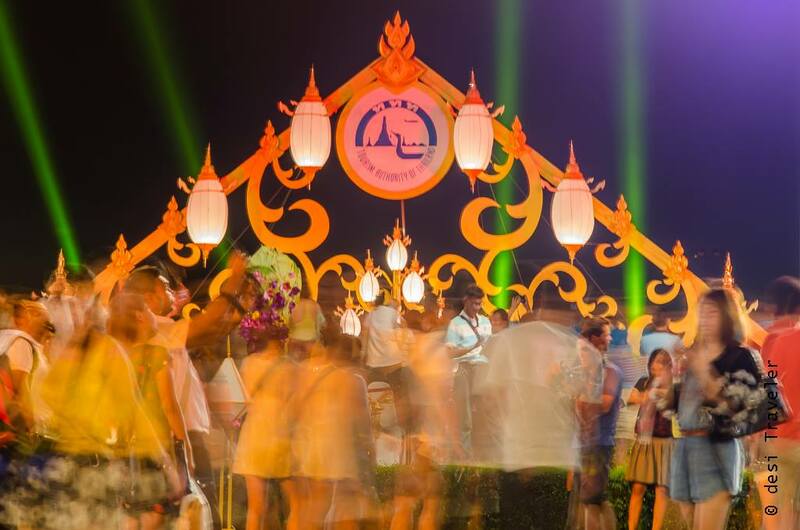 The Loi Krathong festivities are a visual delight and the smiles all around you are infectious, the energy of Universe benign, and everybody is in a jolly mood. 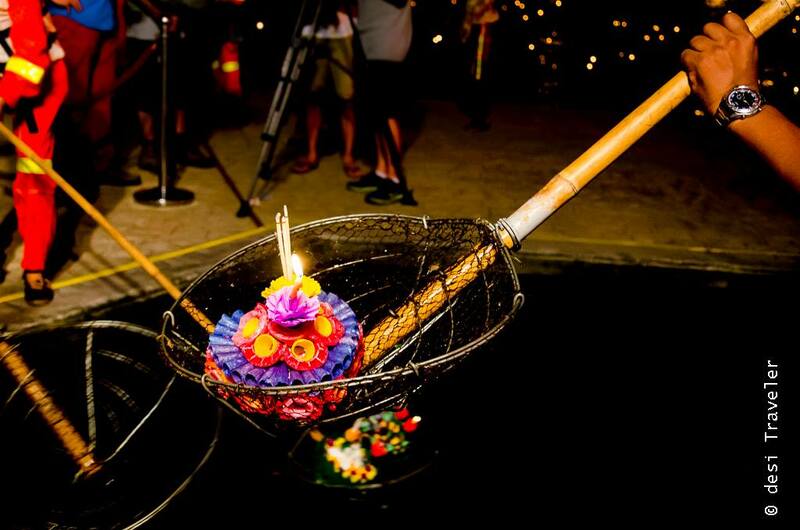 Thais and visiting tourists all want to float their little barges ( Krathong ) with flowers and lamps into the river. Some of them want to take a selfie with their Krathong before they send it to the eternal journey in the waters. Others are trying to jostle for space as they inch towards the water. 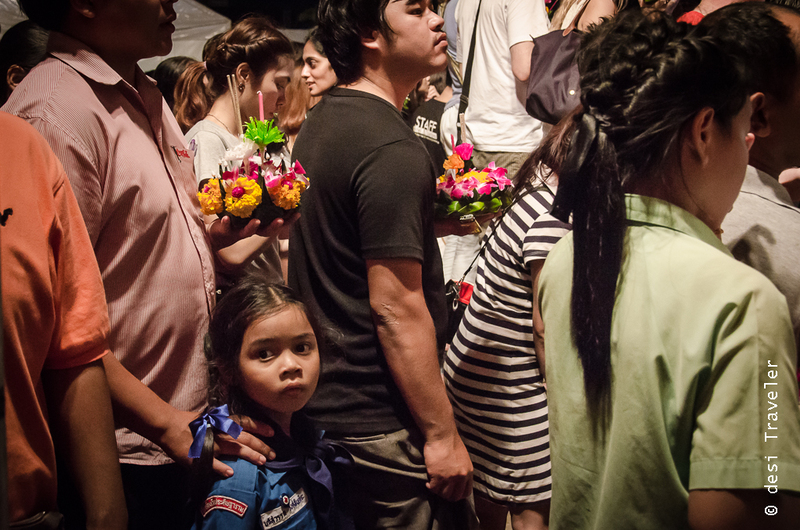 I am looking for a clean shot but I struggle to get a clean shot of somebody carrying a Krathong towards Chao Phraya. I click a few portraits and find this cutie with her dad waiting to move towards the river. I finally have a clean shot of a lady carrying her Krathong towards the water, but her face is in the other direction, she does not know I exist. I focus and click a test shot, and as if the Universe was listening to my prayers, she looks in my direction, our eyes meet, and I see a faint smile ( do you ? ), which I take as a permission to click her picture. I click and the next moment she vanishes in the sea of humanity moving towards Chao Phraya. Did somebody say river of Kings? I think Chao Phraya could easily be river of romance that lasted about seven eternal seconds! As the crowds start thinning after floating their Krathongs in Chao Phraya, I finally move closer to the river bank, but now I don’t want to take any pictures. I just look at the thousands of floating lamps in the river. Just a few minutes ago each one of them was given a message to take to the river gods. 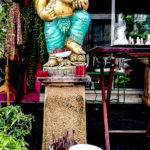 Each of the floating Krathongs on the current of Chao Phraya has a different message, some carry prayers of a mother for wishing success of her son, the other carries hopes of a couple for a future, while some more carry thanks for the river gods for a bountiful harvest. The Krathongs are floated in water but the prayers are carried to the heavens above, as the lamps are an embodiment of stars above. Did somebody say Chao Phraya is river of kings? Well it could easily be portal carrying prayers to the heavens through the Milky Way that descends on its waters once every year. Oh Chao Phraya, I too have a prayer that I request you to carry to the gods. I wish the Thais always keep smiling, their land is always blessed with a bountiful harvest, and every year people keep on coming to celebrate Loi Krathong on your banks to offer their prayers and thanks. O Chao Phraya, keep flowing for you may be the river of Kings, but you are also the river of hope, prayers and a romance that lasted 7 eternal seconds. 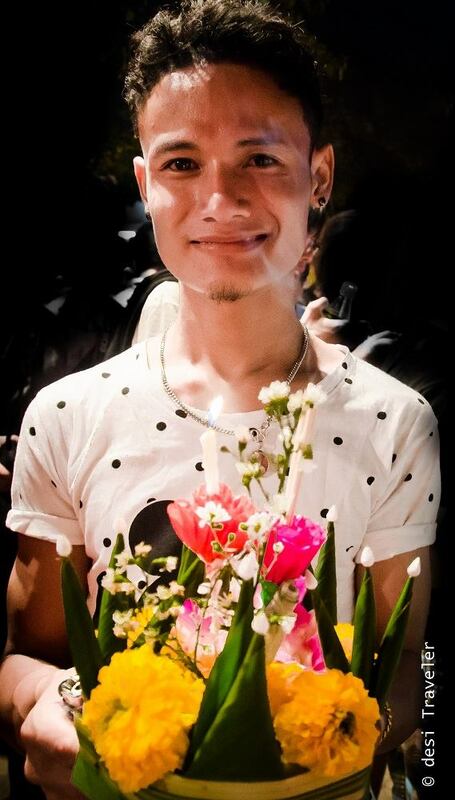 I am sure going again to Thailand. If you have not been to Thailand I suggest you plan a visit. Thailand is a very traveler friendly country and offers Visa on arrival. 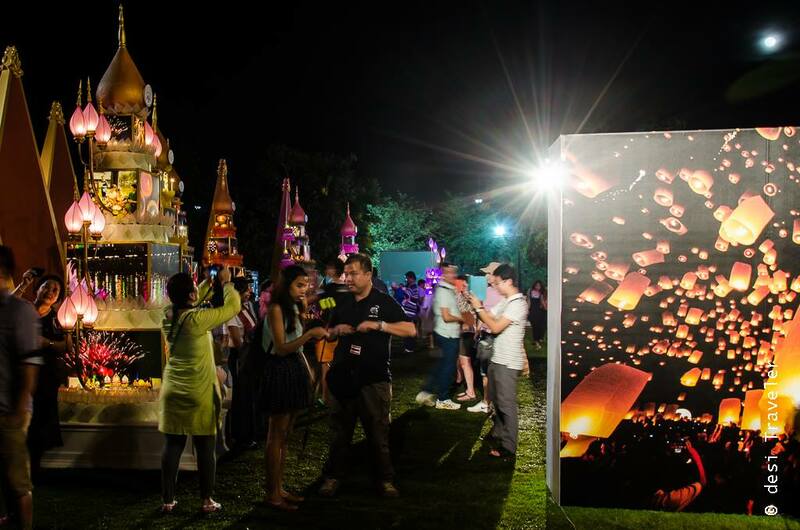 Loi Krathong 2015 will be celebrated on 25th November in Bangkok, Sukhothai, Ayutthaya, Chiang Mai, and many other places. 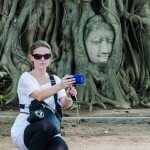 Check TAT website for more information, who were my hosts when I visited Amazing Thailand. It is such a feast to see after-dark events. The lit up floats are indeed enchanting. 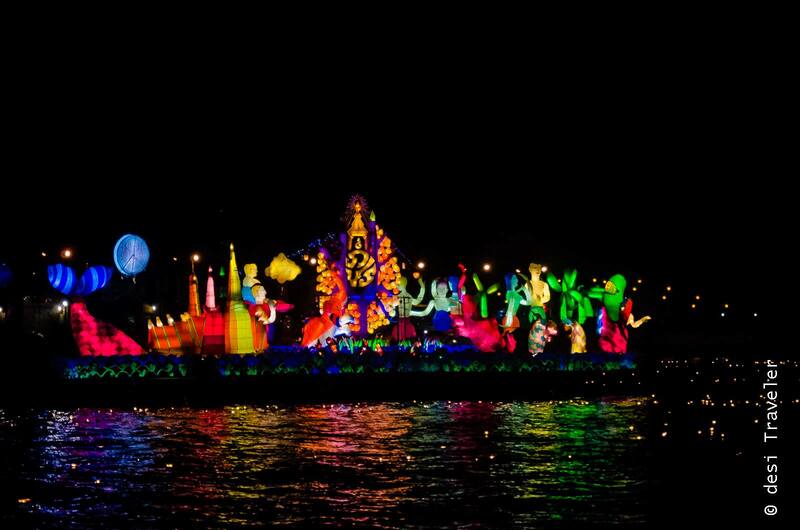 Lovely coverage of Loi Krathong festival. Colourful and vibrant. 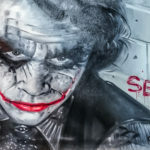 This post has some of the most unique and stunning Loy Krathon images I have ever come across. Brilliant. Thank you for sharing. Wow, these were some gorgeous clicks. 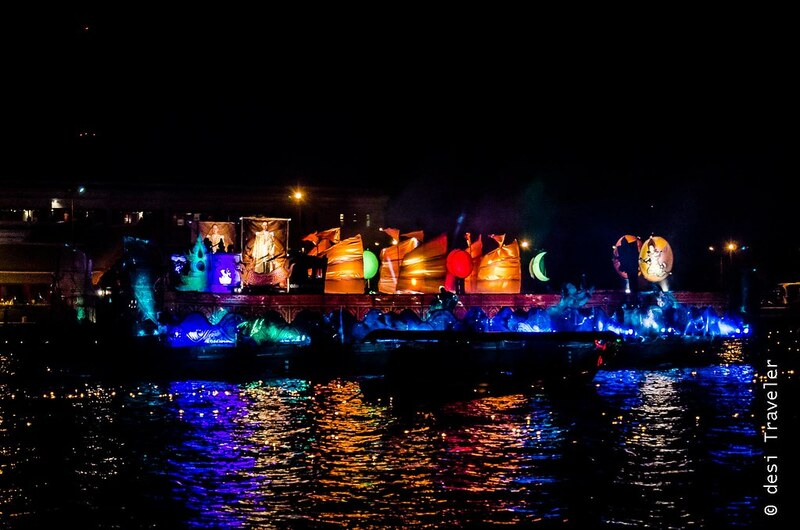 The different themes on the barges are so beautiful. 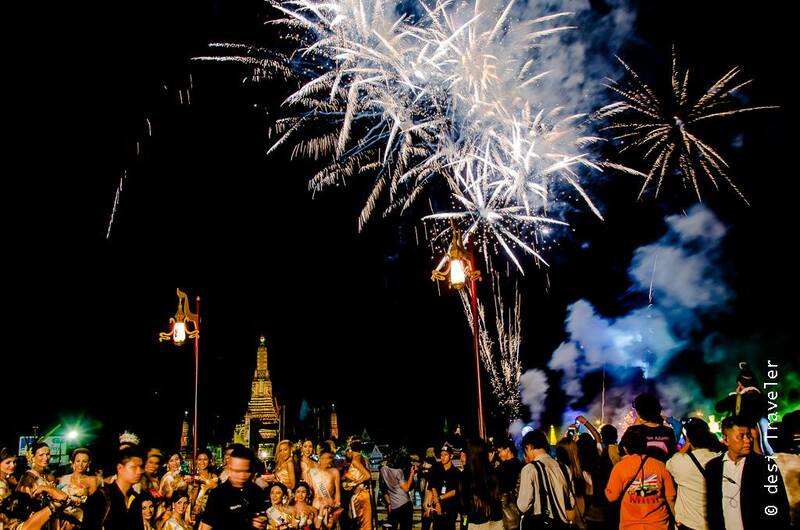 And must say Thailand does an elaborate celebration. I felt Songkran was much soberly played than what we do in Holi in India. I guess even their Diwali like festival Loi Krothong looks peaceful and super colorful. Thanks for showing it to us too! Let us see if I can catch a glimpse of it this year in Bangkok.